Save both time and money on airport parking at Fort Lauderdale Hollywood International Airport (airport code FLL). By booking Fort Lauderdale airport parking in advance, you can take advantage of low online rates and save yourself some pre-travel stress. With the easy-to-use reservation system, you just pay online for one day of parking ahead of time, and on the day of your flight you simply drive to the lot and drop off your car. Then you hop on the free shuttle to the airport, and you are on your merry way! Fort Lauderdale airport parking options are plentiful. “Park ‘N Fly,” “Luxury Airport Parking” and “Air and Sea Parking” are some examples. 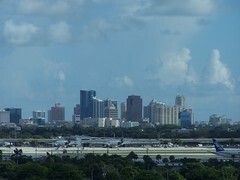 The airport sits between Fort Lauderdale and Hollywood, 21 miles north of Miami. Fort Lauderdale is a very busy airport, thanks to low cost carriers Southwest Airlines, Spirit Airlines (which has its largest hub at Fort Lauderdale), and JetBlue as well as its close proximity to the departure points for multiple cruise lines which explore the Everglades region. The airport has numerous gift shops and restaurants. It also offers a serene public art display and currency exchange for international passengers. For up-to-date traffic information, check out the Fort Lauderdale City Traffic website here. Taxi: Regulated by law Yellow Cab taxis will get you there. Rail: There is no rail service to the airport, although a combination of Tri-Rail (commuter train) and bus will get you there. Bus/Shuttle: Broward County Transit (BCT) buses service the airport. Planning a long drive to or from the airport, or an odd-hours flight? Check out Fort Lauderdale Airport (FLL) park and sleep hotels. Don’t fancy driving to the airport? Or leaving your car there and paying for parking? Catch a shuttle to Ft Lauderdale airport.